Then there is other end of the spectrum – Senator Elizabeth Warren is actually campaigning to get the rates on student loans lowered. 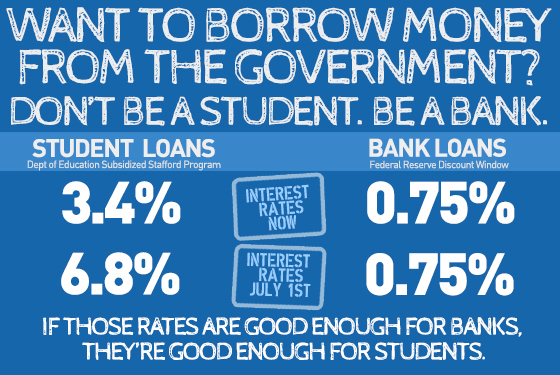 As you can see from the above image, she wants students to be able to get loans for the “same rate as the banks”. I personally find this a bit ridiculous, as the 0.75% rate is the overnight lending rate to the banks. These loans are not being held for 4+ years and it would be impossible to even break even at these rates. Trust me, I am no fan of the banks but I just don’t see this strategy being feasible or sustainable. Whoever is loaning you money needs to either profit (private), or be able to break even (government or non-profit). I’m not 100% sure about all these rate changes, because I’m not sure how much subsidized loans actually come back to the taxpayers but I do agree that student loans should be able to pay a competitive rate. You can get a mortgage around 3% in the current environment and car loans and other loans can also give much better rates when compared to the current student loan market, especially on the private side of things. I know there is a lack of collateral behind student loans when comparing it to mortgage or a car loan, but there is also the fact that student loans are very rarely discharged in bankruptcy – they are with you for life! A better campaign would be to try and keep the subsidized loans at a rate of 3.4% in the current environment, and focus on getting the rest of the student loan rates below 5%. I think this would be a fairly reasonable solution and would help out a lot of students. Of course, we all know what happens when reasonable and Congress are brought up in the same sentence. We end up with two extreme stances and have to hope they somehow to end up on that reasonable solution. I still personally believe the biggest thing that needs to be done about student loans is education as I had said in a previous post. General education on personal finance, taxes, and credit in general would be great too! This topic in general is of great interest to me, because the interest rate on my student loans is what really makes me want to get rid of them. The fact that I’m losing so much extra money each month on top of the money I borrowed is what really is driving me to pay them off as soon as possible. What is your opinion on the current state of the student loan interest rates? Do you think lowering them is the correct solution? This entry was posted in Debt, Student Loans by Debt Hater. Bookmark the permalink. I would love to see the student loan interest rates lowered, but most of the legislation is going forward and not retroactive, so it won’t do me any good. As long as capitalized interest is still in place, a profit would still be made even at .75% interest. Get rid of capitalized interest, or put a cap on the total amount of capitalized interest that can be paid then I’d be perfectly content with interest rates where they are (heading). If I made just the minimum payments on my student loans I’d be paying 200-350% of what I originally borrowed (it varies by loan, I have a lot). How much profit is too much? I agree that it would be awesome to see the rates lowered, but like you it wont do me any good as I highly doubt they will do anything for people already with loans. One change that I didn’t mention it would be good if interest did not accrue until you actually graduated, no matter what type of loan. I think that would help even more than lowering the rates.